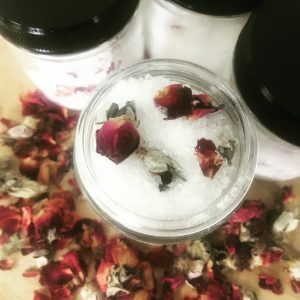 Rose Epsom Salt Bath combines epsom salts with roses and essential oils and a rouch of baking soda to create a relaxing and luxurant bath. One 4 oz jar has 8 tabelspoon size baths or four extra amazing baths. Pairs beautifully with the rose soap and rose body butter we make as well.